Producers of red wines are always advertising the wonderful fruity flavours one can discover by drinking their wares. I have had a complete fruit salad experience over the course of two meals with just one wine. 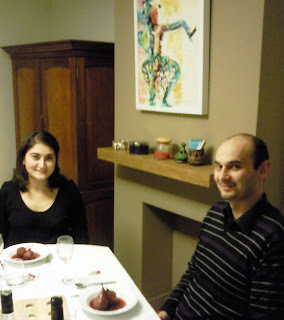 First, I was delighted to host my old friend from agronomics school Bastien and his girlfriend Oz last Sunday night. I had prepared pears poached in wine for pudding. Because I knew I was going to use the wine for cooking, I did not purchase the most expensive wine I could find in the supermarket. I selected a bottle of red Cheverny from the Loire region; a blend of Gamay, Cabernet and Pinot noir grapes. "Very fruity", said the label. The wine had been poached with the pears, sugar, half a vanilla pod and cinnamon powder. Left over in our bowls was a deliciously sweet and light wine syrup, which in the mouth gave out pear and vanilla aromas slowly replaced by lingering cinnamon. However, these flavours were obviously those of the other ingredients cooked in the wine. On the following Wednesday, I finished the leftover wine with my simple dinner of soup, salad, cheese platter and lemon tart but I was quite astonished to discover completely new and diverse flavours from this rather inexpensive wine. Drunk alone, it was not particularly memorable, suitably fruity as advertized. Along with fresh goat's cheese, the berry side came out while accentuating the "goaty" flavour of the cheese. Together with a more mature creamy goat's cheese, the mix reminded me of ripe apples. The real surprise came with the very creamy Camembert. I was expecting the wine to highlight the pungent cheese but instead it mellowed the taste of the Camembert into a cherry-flavoured cream! Finally, with the lemon tart, the wine gave hints of almond paste. I didn't actually feel like having dinner today...but you are describing your fruity experience so well that my belly starts crying 'hungry'. Also, bringing to me the feeling of alcohol kick, my belly is crying so louder that I now need to jump to my dinner!